“Buonasera Signora!” exclaimed a little boy as he flung open the shutters of his home on Via della Galluzza in Siena. The Italians are a towning people and very interested in what others are doing – their enthusiasm is very engaging and my daughter and I encountered it daily on our travels. Locals will begin a conversation, particularly if there are just one or two of you, and ask from where you come; with a mixture of broken English and Italian and a lot of gesticulating, it is amazing how quickly a brief friendship between strangers can develop. This charming city of Tuscany was no exception as we wandered up and down alleys and in and out of small piazzas. Of Etruscan origin, Siena is a walled city and famous for its flamboyant festival and horse race, the Palio, taking place on July 2nd and August 16th each year. The colour and spectacle brings thousands of tourists from all over the globe but, if you wish to avoid the crowds and experience Siena in its day-to-day life and still enjoy good weather, visit during spring or autumn and you will more easily absorb the special flavour of the locals. The crescent-shaped Piazza del Campo is where everything happens. It is in the centre of the city and presents a mosaic of activities. We came across a wedding, families picnicking, laughing children playing and waving flags and, of course, fellow tourists enjoying the splendid architecture, fine art and general ambience. A focus of the piazza is the 15th Century Gaia Fountain, which features sculptures representing figures from both the Bible and medieval Christian legend. It occupies the central part of the Campo opposite the Town Hall and is fed by an aqueduct 25 kilometres long. It is well worth climbing the 400 steps to the top of the Torre Del Mangia – from the tower one appreciates the variegated shading of Siena’s closely-packed, red brick buildings and herring-bone patterned paving. The city sits upon the heights of southern Tuscany and your gaze takes you across the surrounding hills and valleys, many of which remain in their natural state, towards the medieval hill-towns of San Gimignano and Certaldi. The Gothic Town Hall next to the tower houses some of the greatest Renaissance creations, including Lorenzetti’s Effects of Good and Bad Government and Pisano’s stone she-wolves. However, there is so much art in situ in this heady and wild country that you don’t need to queue to peruse museums and galleries. There are marvellous monuments, fountains and palaces at every turn. 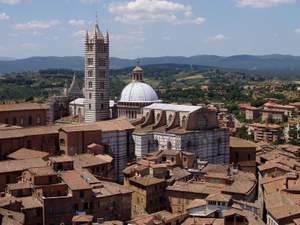 Siena is home to twelve churches, to be found in various piazzas and all within easy walking distance of each other. The sumptuous, pastel marble Cathedral stands in the Piazza del Duomo and displays exquisite sculptures by Bernini – whose breath-taking altar is the focus of St Peter’s Bazilica in Rome – and works by the early 14th century Sienese master Duccio. The inlaid marble floors depict scenes from ancient legend and the pillars with longitudinal bands of polychrome marble are echoed in the Romanesque campanile outside. After absorbing these marvels you will be ready to dine at one of Siena’s many charming ristorantes. Most tourists eat in the Piazza del Campo, but walk through the backstreets and you will discover homely, family eateries where the staff welcome visitors, delighted that you have made the effort to experience food as the native inhabitants do. We found San Desiderio perfetto and indulged in stewed boar, guinea fowl and rabbit, with different luscious sauces and accompanied by garlic spinach and carrot coated in blue vein cheese. Delicioso. The town can readily be accessed from Florence or Rome – we travelled from Rome, on the Florence train, changing at the old Etruscan town of Chiusi. There is accommodation aplenty in Siena and to suit all budgets; ours was a three-star hotel, costing 60 euros per, triple share including breakfast.